Anyone who follows any celebrities on twitter - and I only follow a very few - quickly realizes that the One and True Supreme Twitter Celebrity is none other than Captain Kirk himself, William Shatner. There's something about Shatner and Twitter that goes together like ham and eggs, or eggs and Canadian bacon, or maple leafs and Toronto. Shatner has taken twitter and made it into his own personal fiefdom or, dare I say it, Star Trek Enterprise bridge. This is just one interlude among many for the Shat man, wherein he decides that his bobble head is worthy of promotion among his legion of devotees on Twitter. 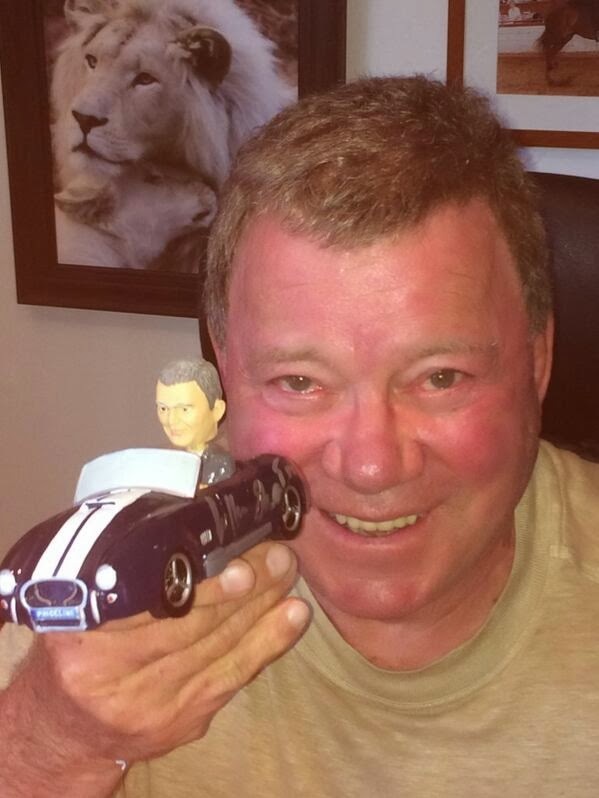 No, I am not promoting Mr. Shatner or his bobble head, I just think this is hysterical that he is so comfortable with Twitter that he casually takes a picture of himself in his office, wearing what appears to be a rough tee-shirt, holding his bobble head with what can only be described as an impish grin. For the record, I think the bobble head in the car has something to do with his famous Priceline classic commercial with Kaley Cuoco of "The Big Bang Theory." Anyway, Shatner is beyond being a good follow on Twitter, he is like the God of Twitter for anyone who is even remotely a fan.